When Walt Disney decided to package the hit Davy Crockett episodes of Disneyland into two feature films for American audiences, it was a stroke of genius since it allowed for them to finally be seen in color (TV was only available in black and white at the time). However his new successful TV series, Zorro, was filmed in black and white to keep production costs down. The Sign of Zorro was originally created for international audiences in 1958 who weren't quite as familiar with the Disney TV series. The US release came a year after the second and final season of the series had aired. For the Zorro TV series Walt Disney created a new section on the backlot solely for production, which would later be reused in many of the studios' Western films. Guy Williams, a former model who was unable to find success in feature films, was given his big break when Walt cast him as Don Diego De La Vega/Zorro. Henry Calvin and Gene Sheldon were placed in supporting roles that created some of the series' best moments. Both would go on to star in several Disney movies (one of which, Toby Tyler, had already been released by this time). Due to the series' strict shooting schedule, several directors were used. As a result, The Sign of Zorro gives credit to both Norman Foster and Lewis R. Foster as directors. The Sign of Zorro presents the first story arc from the TV series. Don Diego is returning to Los Angeles from college after three years of being away. On his way, he learns that Lost Angeles has been corrupted by a new Commandant who runs his own crime ring and puts innocent people in jail. He takes on the alias of Zorro to fight the Commandant and changes his personality to a scholar only interested in books while his servant Bernardo pretends to be deaf and dumb so that people will talk freely in front of him and he can tell Diego what is happening in the town. Zorro's adventures find him saving his father from false imprisonment and fighting a fake Zorro that the Commandant hired to turn the people against Zorro. Eventually the commandant believes that Diego is Zorro and arrests him. When the viceroy arrives to see Zorro, it turns out to be an old friend of Diego's who refuses to believe that he is the masked avenger. The viceroy fires the Commandant and all are seemingly happy. 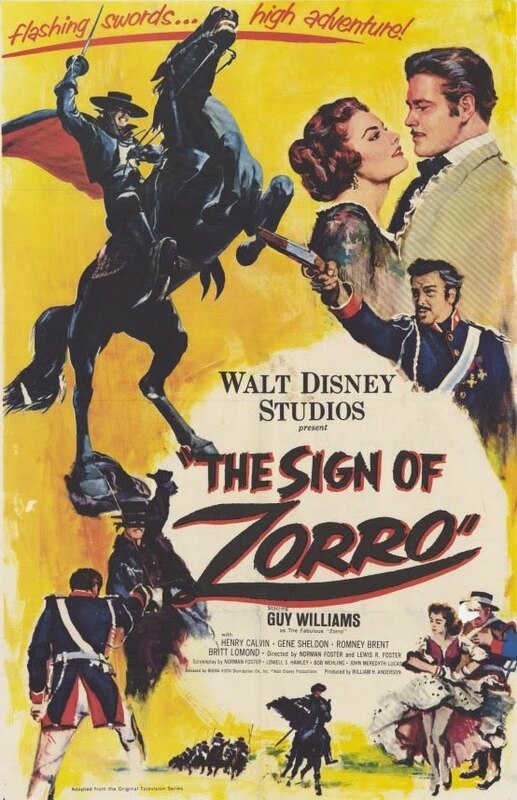 The Sign of Zorro was released on June 11th, 1960. While the Zorro TV series was an instant success and was canceled not due to poor ratings, but a dispute between Disney and the network, The Sign of Zorro was unable to capture any of that success. It was bashed by critics due to it's TV style acting and quick editing. Audiences didn't flock to see it the way they did for the Davy Crockett films either. With Davy, the films were released after only one airing of each episode and there was also the added draw of seeing the film in color. Zorro, on the other hand, had been on the air for three years with reruns, so audiences didn't lack access to viewing Zorro the way they did with Davy. I was never a fan of Zorro as a kid, but have come to like it a lot in my adulthood. I recently watched every episode of the Disney series, so I am familiar with the material from which The Sign of Zorro was edited. I find this film hard to sit through because they tried to cram too much information into a short time frame. Five episodes totaling 125 minutes were edited down into an 89 minute feature. In addition, so many episodes were cut in-between what was selected that having seen the full story arc, I feel cheated by missing what I know should be there. Perhaps I would enjoy it more if I was unfamiliar with the original series. Disney hasn't released The Sign of Zorro on DVD, but it was released on VHS twice. Copies of both releases are fairly easy to come by. The TV series was colorized in the 1980's and both seasons of the series were available on DVD in that format from the Disney Movie Club, but went out of print in 2009. Disney released both seasons of the show in black and white in 2009 through the Walt Disney Treasures series. Those DVDs also featured the four hour long episodes that were on Walt Disney Presents. However the Treasures seasons were limited to 30,000 copies each, which sold out quickly. Scalpers sell them for more than double what they originally cost. The easiest way to own The Sign of Zorro is the iTunes digital copy, where it is presented in fullscreen black and white, meaning you aren't missing any of the filmed picture. I've seen some of the shows late at night when I was a kid when they still had Vault Disney but I don't think I've seen any of the Zorro movies.